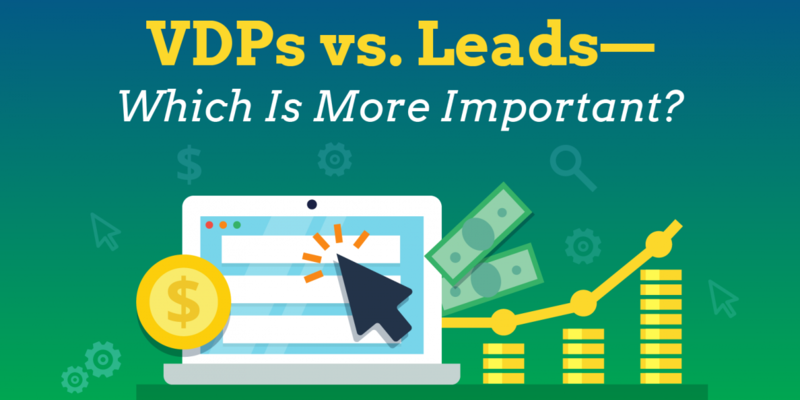 VDPs VS. Leads—Which Is More Important? In case you missed it, a question we get a lot is whether VDPs or leads are more important. This is a topic that could have such a BIG impact on the way dealers do business (and that seems to puzzle many people) that we wanted to make sure we really got to the bottom of it. Everyone knows that most of today’s consumers are doing the majority of their research online before buying a car. So it makes sense that many vendors are focusing on metrics like VDP views and time spent on VDP. But relying solely on these KPIs is a mistake because the real juice is in the leads—the tangible information that can connect you with a real human being. When a consumer starts looking for a car, they’re going to visit a lot of dealership and third party websites looking for information. But when they’re viewing VDPs, they’re doing little more than window-shopping. They come; they look; they leave. Some people claim that these are unqualified leads and that the people who are ready to purchase a vehicle will put in their information once they find what they are looking for on your VDP. And this is true. People who find what they’re looking for in a VDP and then put in their information might be deeper in the funnel. But this places a greater portion of the burden of transacting a vehicle purchase on the customer, which systematically reduces the value a dealership provides. Moreover, 70% of people looking for a vehicle are undecided when they start the shopping process. That means they need help, which opens an opportunity for personal service to make a comeback. The solution, then, is not to add more and more bells and whistles and information to your VDPs, forcing consumers to do the hard work of making a decision on their own. Instead, the industry should use these new pieces of technology to bridge the gap between online search and personalized service. The trick is to leverage the opportunities technology affords us, but also leverage people. For instance, allowing consumers to see a video done by a live professional on a vehicle they like in real time is a great use of today’s tools and resources. Using these videos to help consumers build a relationship with your salespeople and your dealership can increase the connection a consumer has with your business. But if you’re building a relationship, then there must be a next step, a way for you to continue the conversation with the consumer after the video stops. And this is where many dealerships and many of the new technologies for increasing the transparency of VDPs misses the mark—they do the hard work of starting the relationship, but then they drop the ball, leaving you with no way to continue the conversation with potential customers. If you give consumers all the information upfront, they have no compelling reason to become a lead, leaving you with no way to track or get in touch with them. So if they visit your website and don’t find exactly what they’re looking for, they won’t request more information because they don’t realize how likely it is that you can still help them find a solution. In fact, we believe that the anonymous element of many of these technologies is not only unnecessary but also continues a stereotype and promotes a stigma of mistrust rather than allowing people to use technology to truly connect and give and get value from one another. Instead ask website visitors to provide their information before you give them what they want, exchanging value for value. If you do this, you’ll be able to connect with them throughout the buying process and provide additional valuable information. Plus, you’ll see a dramatic increase in leads. Of course, some people will be turned off and won’t provide you with their information. But nearly half of the people will, which is a huge win! NextNew Mitsubishi Franchise Owner Finds Fast Success With Revolutionary Advertising Formula—Could You Be Next? So what is the best practice to engage customers beyond the VDP view? Live chat? Give us more info.